So I finally buckled down today and set up an Instagram account for The Last Stitch. It has been on my mind for a while, but I needed some nudging and processing in order to get it done. Kyle wrote a very thoughtful comment on my Snapchat/social media post a while back about the different flavors of our various internet outlets and that made me think more about how to use Instagram as a sewing space. I’ve had a personal one for many years that I update irregularly at best. But that account doesn’t align with my sewing and blogging interests, plus I wanted something with a more editorial direction. 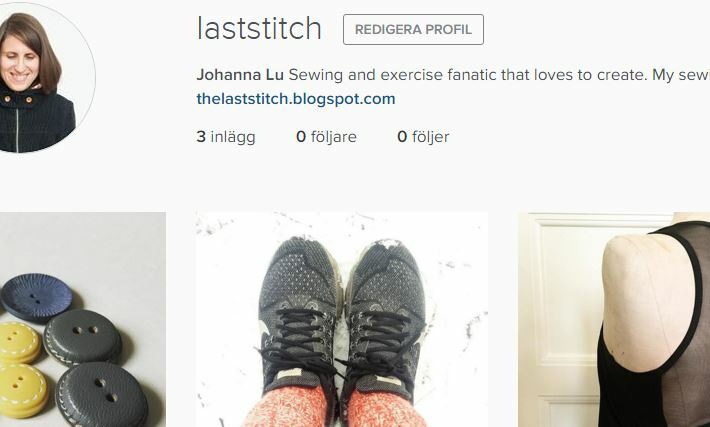 So that idea had been mulling in my head for a while and today when I went on my first run in like forever (or more like a walk/run since I’m returning from a stubborn injury) I had this epiphany of what I wanted my The Last Stitch-Instagram account to be all about. So when I got home I uploaded three photos and well now laststitch is live (thelaststich was taken, maybe I registered it ages ago, or maybe someone else did). If you check it out you will see a sneak peak of my finished yoga top among other things. I just need to take photos of me in it so I can enter Pattern Review’s active wear contest that closes on Monday. Only hiccup is that my resident blog photographer (i.e my youngest daughter) went on a week long skiing trip today with her granddad so that means I will have get that trusty tripod and remote out again. Not too thrilled about DIY:ing to be honest. In fact having Anja to take my photos has been such a boost for my blogging love, plus she is great at it too and really understands my aesthetic. Anyways if you like please check out my account. I will try to make it as an extension of my blog with it’s own storytelling and images and not just a place for repeat posting.We’ll see how it goes! YAY for joining IG! I hope you enjoy it as much as I have! For that fence that you wish was a print, you could make it into a print and have it printed by Spoonflower (though shipping from the US might be pricey–there may be an European equivalent I don't know about). I know what you mean about taking blog photos. It is really hard to find someone who gets what you're going for (like your daughter does) and it's just soooo much easier to have someone else take the pix. I entered the activewear contest last year, took a lot of pix, and then it turned out half of them were blurry because my camera never really recovered from being dropped on pavement. Then for Me Made May there happened to be a temp at work who totally took amazing pix with my cell phone but she got a permanent job elsewhere. So I hear you! !